Being engaged to be married is an exciting time in an intimate relationship. Ready to move forward and actively commit to a life together, partners are soon swept into the wide world of wedding planning. One of the first and highly important decisions a recently engaged couple needs to make is setting a financial budget. The wedding industry is vast and it is easy to become lost in the fantasy wedding of your dreams before checking the price tag of various elements. However, a wedding is not meant to put the couple into debt nor does it need to be expensive to create a lasting, happy relationship. What is the family investment? Traditionally, the bride’s family pays for the wedding and the groom’s family pays for the rehearsal dinner. However, modern styles of weddings and changing economic standards lead to a multitude of less traditional setups. Some families cannot afford to meet a couple’s desires, and some couples prefer to pay for the event themselves so they can make the final decision on what is included. Talking to your family about any money they plan to contribute to your wedding is a valuable first step in establishing a budget. Although money can be a touchy topic for some families, you do not want to miss out on extra funds that can be used for the wedding or your life afterwards nor do you want to assume you will receive financial assistance where none will be offered. There are multiple facets to a wedding that cost money, from the venue, to the decor, to the photographer and officiant, and so on. Take a look at the most common wedding expenses, and cross out, underline, or circle the items that you care less about, care a little about, and care a lot about, respectively. Once you have gone through the whole list, have each partner rank his or her top three priorities. Talk with your partner about what is important to you and why. Try to identify the areas that you are willing to spend more on and those that you can spend less on or find a cheaper option. 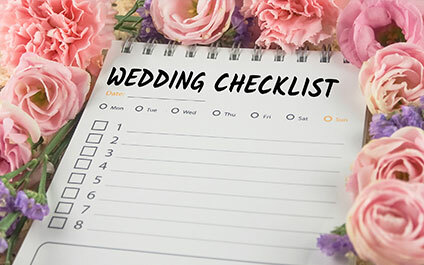 Once you have an idea of how much money you have to spend on the wedding and your priorities, it is time to set rigid boundaries for your budget. The wedding industry will not inherently help you, and it is beneficial for you and your partner to be on the same team. Take a look at estimated percentages of your budget that are typically spent on various aspects of a wedding to get an idea of where your boundaries should be. Make a commitment to stick to these boundaries for the sake of being in a less stressful and more flexible position after the wedding is over. Being engaged offers many couples the first real opportunity to manage a substantial financial decision together, and the best way to avoid conflict and unwanted surprises is to embrace open communication and collaborative problem solving. Setting a realistic budget for your wedding allows you to enjoy the day without worrying about the financial repercussions later, and it also leaves you in a healthy position moving forward. The experience of collaborating to make a shared budget will help you the next time that you and your partner must make financial adjustments together, such as when you buy a house or begin planning to have children. If you feel uncomfortable approaching the topic of finances with your partner or family, consider seeking premarital therapy from a relationship counselor at Symmetry Counseling Chicago. Therapy offers a safe space to talk about your priorities and aspirations, and a good therapist can guide you to make sound financial decisions that best reflect your personal and relational priorities.